Figure 1:The image was taken in a TEM at only 120 kV accelerating voltage! Your browser needs to have Javacript enabled. 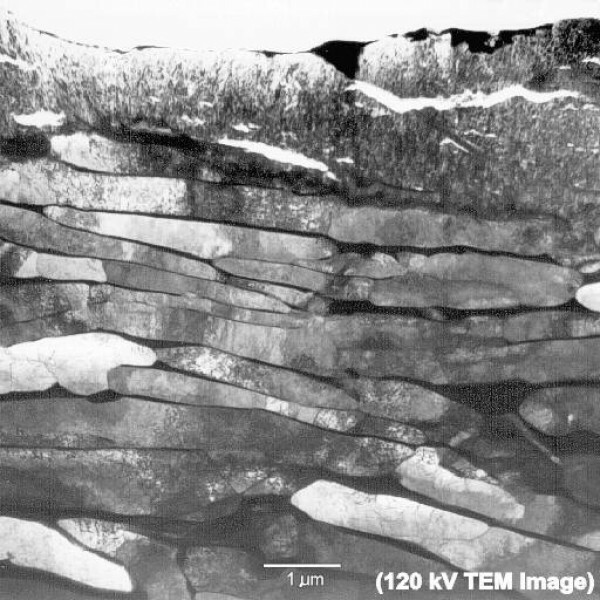 Precision, "stress-free" FIB sectioning can be used to prepare EELS thin TEM cross-sections of "challenging" specimens, such as this surface oxide grown in 300 degrees C water on Zr-2.5Nb CANDU reactor pressure tube material. The image was taken in a TEM at only 120 kV accelerating voltage! Various gases can be delivered into the FIB chamber in close proximity to the region of the sample being imaged. The ability to deposit either tungsten (from FIB decomposition of tungsten hexacarbonyl) or silicon dioxide (from FIB decomposition of oxygen and a siloxane derivative (TMCTS)) provides a range of "surface protection" which can be deposited prior to XTEM preparation to preserve surface topography, porosity, and structure.